Since 1998, Park & Bae (Park, 1999; Park et al, 2001; Bae et al, 2002; Bae et al, 2002) have started to use surgical micro-screws (1.2mm in diameter) to retract maxillary anterior teeth after placing them between the roots of upper 2nd premolars and 1st molars. The treatment was very successful without any complications. They also showed that almost all kinds of tooth movement were possible including molar intrusion, molar protraction and whole dentition retraction using small diameter of micro-screws. These micro-screws were inserted into many areas of maxilla and mandible such as in between roots of adjacent teeth and midpalatal suture which were previously unavailable for conventional dental implants. In addition, they showed that micro-screw head can be exposed when it is placed on the attached gingival area. Originally, micro-screw was used to fix mini-plate into bone in surgical fields. So, it was difficult to apply orthodontic elastomers onto the screw head without forming connectional ligature wire loop on the cervical portion of the screw. Thus, there was periodontal involvement which was caused by the location of ligature wire that is under the screw and towards gingival, even though the screw itself was located on the attached gingival area. This micro-screw location allowed gingival embedment of ligature wire producing steady irritation on soft tissue and also caused difficulty for patients in keeping good oral hygiene around the screw. Fig. 1 A typical surgical microscrew (left) and the newly designed AbsoAnchor® microimplant with nickel titanium coil spring attached (middle & right). To compensate for these drawbacks, we developed orthodontic Microimplants (AbsoAnchor®), which has been designed specifically for orthodontic purpose and has a button-like head with a small hole. Also, by giving inclination on cervical area of the button allows natural separation of elastomers from gingiva. A hole is made in upper structure for smooth application of elastomer such as elastomeric thread and/or ligature wire (Fig.1). This newly designed microimplant has helped to solve the main objections to previous implants and surgical screws (Sung et al, 2006). AbsoAnchor® microimplants come in several sizes of diameter ranging from 1.2mm to 2.7mm. 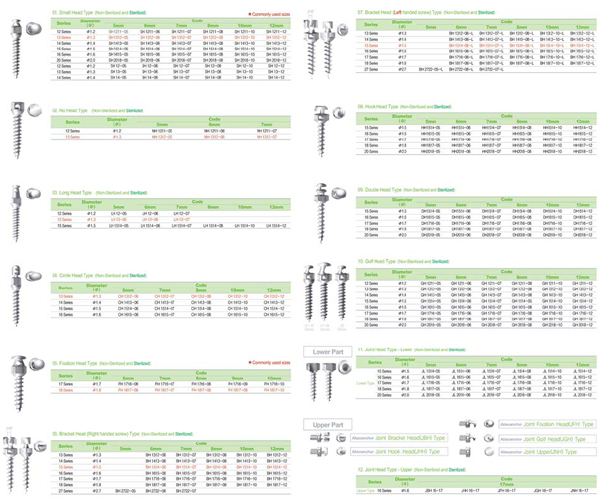 These titanium alloy (Ti6Al4Va) micro-implants also come with different types of head for different applications and sites (Fig.2). However, many orthodontists are still hesitating to use orthodontic microimplants, because many of them are afraid of surgical intervention and post-surgical complications. But unlike prosthetic implants, there is little complication, and every dentist including orthodontist can insert orthodontic microimplants due to its ease of application. Here, we would like to introduce you to AbsoAchor® microimplant system as an orthodontic anchorage for your practice. Fig. 2 Orthodontic AbsoAnchor® microimplants developed by Dentos Inc.